Trump said the US had spent six trillion dollars in the Middle East -- he did not say on what or over what time period -- while US infrastructure deteriorated. WASHINGTON: U President Donald Trump pledged Tuesday to bring one trillion dollars in public and private investment to rebuild what he called America's crumbling infrastructure. Trump made the promise in a high-stakes speech to a joint session of Congress, moving to make good on one of his main campaign pledges -- rebuilding America's roads, bridges, airports and other public structures. 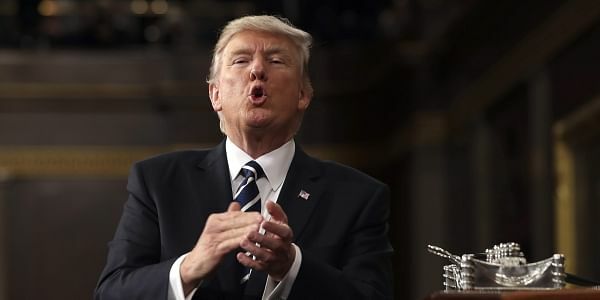 "To launch our national rebuilding, I will be asking the Congress to approve legislation that produces a $1 trillion investment in the infrastructure of the United States -- financed through both public and private capital -- creating millions of new jobs," Trump said. Trump said the United States had spent six trillion dollars in the Middle East -- he did not say on what or over what time period -- while US infrastructure deteriorated. "With this six trillion dollars we could have rebuilt our country -- twice. And maybe even three times if we had people who had the ability to negotiate," Trump said, reiterating his argument that his new administration will be better than previous ones at defending US interests when it comes to making a deal. Again without giving details, Trump promised to introduce a "historic" tax reform. He said this will cut corporate taxes on US companies "so they can compete and thrive anywhere and with anyone. At the same time, we will provide massive tax relief for the middle class." "Currently, when we ship products out of America, many other countries make us pay very high tariffs and taxes -- but when foreign companies ship their products into America, we charge them nothing or almost nothing," Trump said. He said he had a recent meeting with officials from Harley-Davidson who, he said, told him their motorcycles, in one particular unnamed country, are slapped with 100 percent taxes. "They weren't even asking for change. But I am," Trump said. "I believe strongly in free trade but it also has to be fair trade."